“ A small piece of land, lost in the ocean”. Florianopolis is the capital of Santa Catarina and is also called Floripa, a town of 350 000 people. Nature is exciting, there are exquisite beaches of various kinds, hidden bays to open sea shores, evergreen rainforest mountains, dunes and lagoons. Almost half of the island is a nature preserve. The island is a paradise for active and ecotourism. The small and picture postcard centre Lagoa da Concelcao has a few delicacies to offer. This magic island is a secret recommendation of Brazilians. The swimming season begins in December and ends in March. Excellent for active tourists (hikers and nature lovers) is the low season from June to November, often with cooler temperatures (a little too cold for swimming). 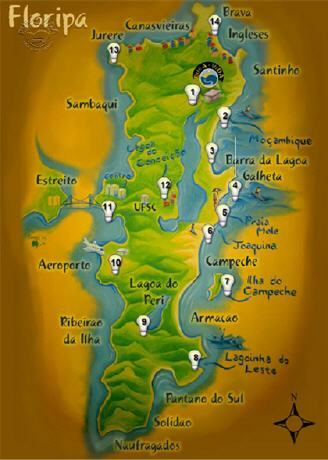 The camp is situated in the northeast of the island, in the district of “Rio Vermelo”. Within a few minutes by car lies the 12 km long (and for many locals the most beautiful) surfer beach of the island, the “praia Mocambique”. Nearby are other beautiful beaches , i.e. the “Barra da Lagoa”, “Mole” or “Joaquina”. 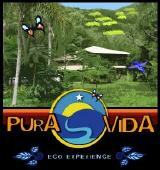 The Puravida lodgings were built in 2002 in the old tradition with local stone. It is the meeting point for the morning ritual, breakfast with local produce and fresh fruit and in the evening a cozy relaxing together. The large kitchen is also available for personal use at lunch and supper time . The stone house is surrounded by juicy, green, atlantic rainforest. The surroundings are a true paradise, far away but not too remote from civilization. Purvida offers a harmonious enjoyment of nature. The “Cabanas” offer greater privacy. There are 2 separate bedrooms with their own veranda and hammock, the bathroom and WC are shared. Enjoy the evening with candle light in this idyllic and beautiful atmosphere, filled with the animals songs. Our luxury is nature! The cabanas have no electric appliances, no TV, air conditioning or refrigarator bar, but you can re-charge your camera batteries in the “Stonehouse”. - there are over 42 different beaches and lakes with a circumference of 25 km! - public transportation is very hard to find and takes up a lot of time! - safe and European style driving is possible! With your vacation at Puravida you financially support the fish otter project www.ekkobrasil.org.br. You make it possible for “Tup, Lara and Pretinha and many other otters to have a safe home. During your vacation you can, if you wish, participate in the project Ekkobrasil. Junior, who is the responsible project leader or one of his co-workers will take you out to sea to observe these cute animals and you will get to know something about them. It will be a memorable experience! Upon arrival at the airport “Hercilio Luz” in Flrianopolis, the guests are personally greeted by the car rental “Le Mans”. A short reception and transfer of the car rental. Information and map for arriving at the Nature Camp Pura Vida. The drive to PuraVida takes 40 minutes. The long awaited vacation can now begin, “seja bem vind”!